Read the Vauxhall Corsa hatchback (2011 - ) car review by Auto Trader's motoring experts, covering price, specification, running costs, practicality, safety and how it drives. The Vauxhall Corsa is one of the UK’s best-selling superminis, and although it’s not one of the best, it has plenty to recommend it. It’s affordable to buy and run, easy and comfortable to drive and it looks good inside and out. Interested in buying a Vauxhall Corsa? The Vauxhall Corsa is available with three or five doors – three-door models have a sporty, coupe-like roofline while five-door models are squarer at the rear and look more practical. Whichever of these you go for, the Corsa is a sharp-looking little car, with some interesting details and well resolved lines. Alloy wheels only come as standard with a handful of the trims, but if you opt for one of the sportier models, you’ll get a sleek body kit as well. If you like proper hooligan-style looks, go for the range-topping VXR hot-hatch version. The Corsa’s interior looks smart and feels solid, and although the materials don’t feel as posh as those in a Volkswagen Polo, the cabin still manages to convey a certain cheerful sophistication. Beware, though, that the most basic models don’t have driver’s seat height adjustment or a rake- and reach adjustable steering wheel, so getting comfortable might be tricky in these versions. The bulky windscreen pillars in all versions can also block your view at junctions, but at least the simple dashboard layout makes it easy to find and use the various controls. The Corsa is most practical in its less stylish five-door configuration, which gives more headroom in the rear. In both versions, interior space is adequate rather than class-leading, but four adults will be able to sit in reasonable comfort. In the same vein, rear seat-up boot space is identical between the two models, and while it’s adequate for the class at 285 litres, many rivals offer more space. Space with the rear seats folded is slightly better in the five-door, but it’s important to note that only a handful of trims come with split folding rear seats. On its standard suspension, the Corsa offers a good balance of comfort and driver enjoyment. It changes direction sharply enough, and the ride is impressively comfortable. The steering is fast to react, and the tight turning circle makes parking manoeuvres easy, but the steering is also rather light, which doesn’t inspire much confidence at high speeds. Sportier SRi models get a lowered suspension that many will find too harsh. The VXR versions are sportier still, but although they’re good fun in an unruly sort of way, they can’t match the best hot hatches for driver involvement. Five petrol engines and two diesels are offered in the Corsa. The naturally aspirated petrol options are a 64bhp 1.0-litre, an 84bhp 1.2-litre and a 99bhp 1.4-litre, but only the 1.4 really has the guts for the job. There’s a 118bhp 1.4 turbo as well, but we haven’t yet tried it. We have tried the 189bhp 1.6 turbo in the VXR model, though, and it gives proper hot hatch acceleration. The diesels are both 1.3-litre units giving either 74bhp or 94bhp. They suit the car well, with plenty of mid-range pull making your progress very easy-going, but they’re rather expensive to buy. The Corsa’s list prices aren’t particularly cheap, but that’s just the starting point for negotiations because Vauxhall dealers will happily give you a massive discount if you haggle. Just as well really, because the Corsa doesn’t hold onto its value very well and a decent discount will help offset your losses. Running costs are pretty low, too. All but one of the engines on offer beat 50mpg, and all but two emit CO2 at a rate of less than 120g/km, meaning low tax bills. All the diesels beat 60mpg and the best of them will manage almost 86mpg. Vauxhall doesn’t do too badly in Warranty Direct’s manufacturer standings, currently hovering around the mid-table mark. The Corsa itself doesn’t score as well as other Vauxhall models, though, with a rather disappointing Reliability Index rating. The most common problems seem to occur with the engines and suspension. 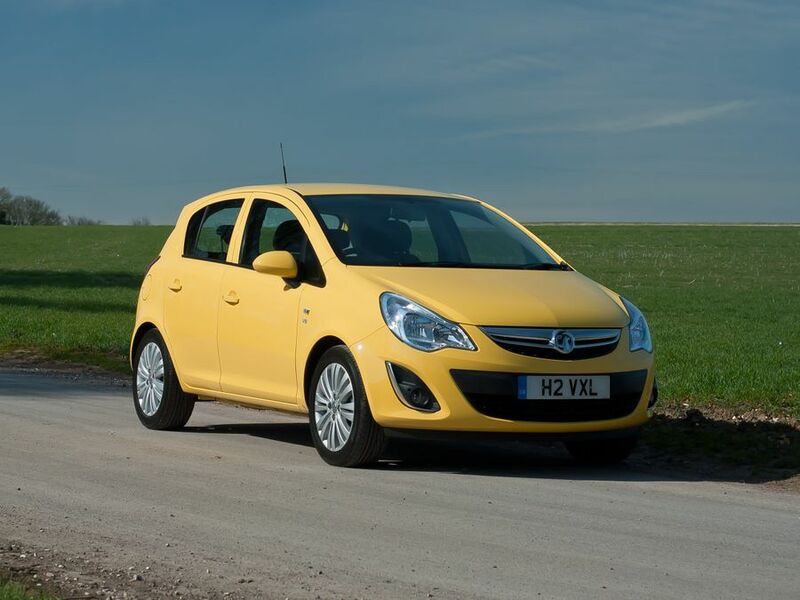 The Vauxhall Corsa scored a full five-star rating for adult occupant protection, but the test was carried out before 2009 when the testing procedures became a lot more stringent. We can’t guarantee it’d score as well if it were tested today. More of a concern is the shortage of safety kit on the most basic models. Many only get driver and passenger front airbags, and you have to upgrade to rather lofty SE trim to get side and curtain ‘bags. Likewise, you have to pay extra for stability control on all models except the range-topping VXR. The Corsa is available in a dizzying array of trims, and Vauxhall is forever punting out special editions on top. The basic trims (Expression, S, Sting and Design) look rather mean on luxury kit, but SE trim comes with most of what you’ll want, including alloys, air-con, cruise control and automatic lights and wipers. SE models are quite pricey, though, and you still don’t get a USB socket or Bluetooth, which are commonplace in the Corsa’s rivals. The Vauxhall Corsa is a pleasant and easy car to drive, and with efficient engines, it’s cheap to run. It falls behind the best in class in a number of other areas, though, and the equipment you get is rather stingy, especially when it comes to safety. A Ford Fiesta will cost you about the same, and it’s a much better car.